When founders Koerner and Joan Rombauer moved their two children, two horses and five dogs to Napa Valley in 1972, they arrived armed with an appreciation for the intimate relationship between food and wine. Their appreciation stemmed from Koerner’s great aunt Irma Rombauer having authored internationally renowned cookbook the Joy of Cooking and his ancestors originating from the winegrowing region of Rheingau, Germany, where wine is considered an essential complement to a meal. The Rombauer philosophy hasn’t changed since our founding in 1980: We believe in doing everything in our power to produce the best wines possible. With just three head winemakers in our 35-year history, we’ve achieved consistency of style — distinctive, fruit-driven wines — while continually refining and improving our winemaking practices. Richie Allen, our Director of Viticulture and Winemaking, embraces traditional and cutting-edge practices in the vineyard and cellar to make certain each wine gets the customized attention it needs. This marriage of old and new begins with optical sorters, ensuring only the best fruit makes it into our wines. All lots are separated, no matter how small, allowing Richie to determine the best fermentation and aging option for each. For reserve red wines, barrel fermentation is used to produce a more textured palate and silky tannins, and up to 25 types of French oak barrels are used for fermentation and/or aging. For all wines, a basket press and peristaltic pumps — larger versions of those used to move blood during surgery — provide for gentle handling every step of the way. Our caves provide ideal conditions for aging red wines. Along with Richie, Associate Winemaker Luke Clayton and Assistant Winemaker Andrew Holloway round out our winemaking team. Each started out as a harvest intern at Rombauer, working their way up to their current roles. 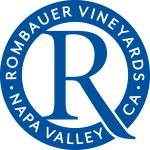 They have a combined experience of more than 30 years producing Rombauer wines. Guided by their passion and expertise, Rombauer spares no effort or expense to produce the finest wines each vintage offers.